From 5th – 20th July 2017, Kathy Walking, Nikethana Venkatesan and Mamta Kandari represented Eco Femme, Auroville on a visit to Zanskar Valley, Ladakh in collaboration with Roots Collective, an NGO based in Ladakh. 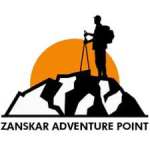 The organisations Zanskar Adventure Point and Roots Ladakh served as travel partners for this trip. Research: To explore the existing traditional menstrual culture and practices in the area. Education: To fill in gaps in knowledge about healthy management of the menstrual cycle and choices of non-polluting product options with the women and adolescent girls in the local community. Product: Evaluate the options for hygienic, non polluting MHM products that would be acceptable to the local women/girls and favorable to local conditions – identified through product analysis. The time intensive work of behaviour change communication – the fact that getting women to adopt to cloth washable pads needs a conversation and explanation of the benefits of the product before women would be ready to make the switch. We also talked about how because this marketing effort requires a considerable effort and time in the beginning, local livelihood will really only make sense when there is a sufficient number of women who are ready to adopt and buy the product. The other challenges for local livelihood include sourcing suitable local materials and especially when using natural materials the costings – Eco Femme for example has to subsidize cloth pads to make them affordable to economically disadvantaged women and for local women producing cloth pads without access to subsidies or alternative income streams, it is not a cost making enterprise based on the limited prices women are willing to pay. We are also not a medical team so specific menstrual health related problems are not something we have expertise to fix (we can help figure out if problems are there but treatment is likely beyond our scope). The trip was very clearly exploratory, with very little existing information on the traditional and current menstrual practices in the region. We at Eco Femme have always approached communities with humility, curiosity and an open mind, well aware that traditional practices and indigenous wisdom has much to teach us as well. Working with menstrual health is complex because the menstrual experience has health, cultural, economic and environmental dimensions and there is no one “solution”. We aimed to try and engage conversations around the topic, to ask questions get a sense of the women’s needs and practices and from there think together with them about how to approach these needs. A key point of interest for Eco Femme is to try and promote sustainable and eco friendly menstrual products, discouraging disposable sanitary napkins because of the detrimental environmental impact. Cloth pads are not always the right fit for the community and part of our work is to assess what sustainable menstrual product(s) might be right for the community. 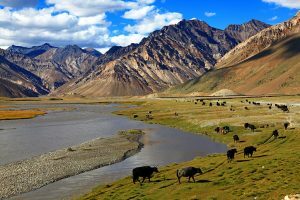 The villages in Zanskar were inaccessible by road and the only way to get there is through trekking, via high altitude terrains and passes of up to 5100 meters above sea level. We started our conversations in Padum and were able to reach 3 more villages before the end of the trek, falling short of our initial target of 8 villages. Unfortunately due to unforeseeable circumstances including the bad weather on the higher slopes, ethnic tensions and logistics reasons, the route for the trek across Zanskar valley needed to be changed and shortened. We finished the trek on the 15th of July, 4 days earlier than planned. 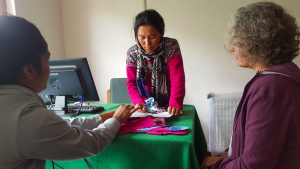 Visiting the Community Health Centre in Padum, the capital of Zanskar we spoke to 10 health exploring traditional and current menstrual practices. A mixed group of women practising Islam and Buddhism, it was clear that while menstruation in general was not considered a welcome monthly event, there were no big taboos that prevented safe hygiene practices amongst the women. The women used a combination of recycled cloth and the commercially available disposable napkins for their monthly flow, with some of the younger women using only disposables. Cloth has been traditionally used by the women, with the practice being to wash, sun dry and reuse the cloth for a few cycles. Convenience and leak-proofing were cited as key advantages of using the commercial disposables. Key to this exploration was the product analysis where women were introduced to 6 different sustainable menstrual products to catch/absorb menstrual flow – the Saaki and Aakhar biodegradable sanitary napkins, Saafkins, Eco Femme cloth washable pads (2 models), and the Boondh menstrual cup. Session with the health workers, Padum. The health workers showed keen interest in the menstrual cup, with one of them already being a user who was happy with the product. Interest was also shown for the Eco Femme pads. Samples of the Eco Femme pads have been sent for the women to trial and the Boondh menstrual cup company contact details have been shared for the women to order and stock them. The Eco Femme pads have been offered at a subsidised of Rs. 50 per pad for the women who are economically disadvantaged under our Pads for Sisters program and Boondh will also offer a subsidy. 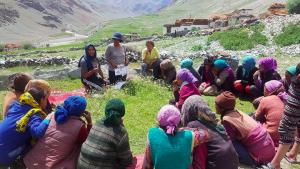 With Padum being a key town in Zanskar valley, the health centre was identified as a central point of distribution with the health workers reaching out to women from the villages interested to invest in sustainable menstrual products over disposables. 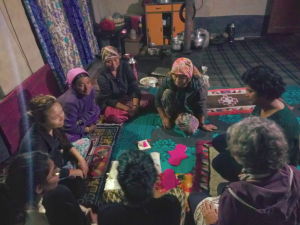 Late in the evening, after the women’s daily work, we had a short focus group with 5 women from Anmu village, one of whom translated in Ladakhi for the women. While 4 of the women were older and lived in the village, the woman who translated lived and worked in Himachal Pradesh was younger/unmarried and was there in the village on a holiday. Only she was a disposable pad user, with the others using cloth. This was a trend we noticed across the villages, with the younger generation slowly making the shift to disposables. It is important to note that the 4 women who used only cloth were happy with their current practice and did not express any wish to shift to other products. We primarily did a product analysis exploring what the women’s thoughts were on the various products and what they would prefer if they were available in the market. The menstrual cup was universally unpopular. The women were very interested in the Eco Femme pad citing the following reasons: a material they were familiar with, aesthetically pleasing and that it came with a leakproof layer. The DSN user preferred the Aakhar pad as it functioned similarly to the disposable pad with better environmental impact. After a day long trek we reached Khansar where we were only able to meet with one woman who came from the family that hosted us. 26 years old, she is a doctor-in-training wanting to come back to the village after her studies to serve the local area. She revealed her thoughts on the cultural taboos in that specific area where she mentioned that the women do not practice safe hygiene practices in washing and drying the cloth. She was a disposable pad user also and in discussing the various sustainable menstrual products she voted for the Saakhi/Aakhar pads as she liked their disposability. She felt strongly that cloth was unhygienic and did not want to wash and dry them. She expressed appreciation for the conversation around menstruation. In the village, menstruation was considered a normal process and not considered taboo, with mothers generally introducing the daughters into the practices of safe menstruation. Even still, the younger women especially were very shy about the topic and remained mostly silent during the session. The older women recognised that menstruation was connected to fertility even though they did not track their cycles on a calendar. They know the start of the period through changes in their bodies such as back pain and increased white discharge. Some of the younger women noted their period dates in a calendar. 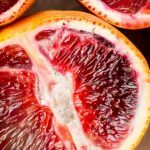 The women revealed that there were local herbs that were used for pain during menstruation. One practice here that many women agreed with was the reduced intake of water during their period. They believed drinking water increased the duration of the period. All the older women and some of the younger women used cloth. They were aware of the importance of safe drying and sun dried the cloth. 4 of the younger women used disposable napkins. They sourced them from the nearest town (at least a 10 hour arduous walk). They liked the convenience of the disposables but did not like the disposal. Most of them burned the pads and were aware that this was not healthy for them or the environment. They expressed a wish to shift to more environmentally friendly options and preferred the disposable Aakhar pads over the reusable options. There was no interest in the menstrual cup. Some women were curious about the Eco Femme pads and expressed interest to use them. Others liked the Saafkin model that could be used without underwear. The women remained engaged throughout the session and found the session on product analysis particularly interesting. The women all agreed that they wanted to talk about menstruation more amongst themselves and appreciated our session. 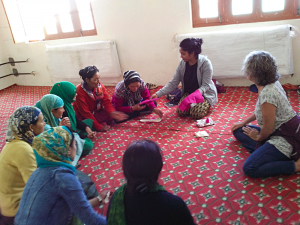 In Leh, we spent a few days talking to various groups and women’s organisations. In particular, we conducted sessions on sustainable menstruation with adolescent girls in SECMOL ( The Students’ Educational and Cultural Movement of Ladakh) and the Tibetan Children’s Village (TCV) Ladakh. We also talked about our work with the Ladakhi Women’s Collective and the Women’s Alliance in Ladakh and discussed the potential of women being rural entrepreneurs selling our subsidised cloth pads to the women in the remote villages. 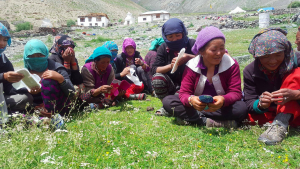 Reflecting the shift in modern India, in Zanskar valley as well, there is a clear transition happening in the younger generations that are being educated outside of the villages towards the use of disposable sanitary napkins. The culture was strongly Buddhist with a tiny minority of Muslims in the area. The vast majority (bar one woman) do not believe that women practice poor menstrual hygiene or use products dangerous to health (e.g. sand, newspaper) in this area. They do not feel that cultural practices observed during menstruation are restrictive. 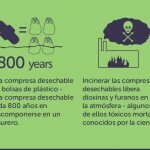 Recycled cloth continues to be the dominant menstrual product. The conditions are optimal for the use of cloth with year round supply of clean water and abundant sun for safe use. For many the educational sessions were a first exposure where they felt they learned a lot of important information. Women were interested to make their own cloth pad at home when we suggested ways that they can improvise at home. The discussion on the environmental effects of disposable sanitary napkin waste was impactful. The concept of formal cycle tracking was new for most of the women and a practice the younger women expressed interest to adopt. Even though there was no interest to use or try internal products outside of Padum, the women appreciated learning about the range of menstrual products. Overall they enjoyed very much the experiences and were appreciative of the exchange. We hope that Padum can be a central point of distribution in Zanskar region. We have started a trial of the Eco Femme cloth pads with 7 health workers in the community health centre in Padum and have connected them to Boodh menstrual cup company as well. Overall, the trip revealed that this is a key time for this intervention in the area as it is clear that there is a growing shift towards the use of disposable sanitary napkins in the ecologically sensitive higher ranges of the Himalayas. 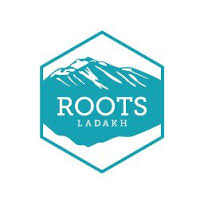 We at Eco Femme are grateful to have been invited to conduct this journey and appreciate the hosting efforts of Tariq and the team at the Roots Collective and its travel partners, Roots Ladakh and Zanskar Adventure Point. 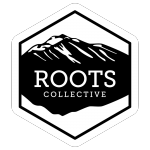 About Roots Collective: Roots Collective India (www.rootscollectiveindia.org), a registered local NGO based in Ladakh has been working in the region on projects relating to Heritage Activation, Conservation, Education and Ecological Concerns for the last 2 years. About Eco-Femme A women-led social enterprise founded in 2010. Based in Tamil Nadu, India, Eco Femme’s aim is to create environmental and social change through revitalizing menstrual practices that are healthy, environmentally sustainable, culturally responsive and empowering for women around the world. We produce and sell washable cloth pads, provide menstrual health education to adolescents, and open dialogues on menstruation all along the way.